Beginning with a small machine shop in Mason, Michigan a father and son team designed and produced many different products, including metal tape measures, identification "dog" tags for military personnel, key cases, refrigerator shelving units, and even child toys. By the late 1950’s the two decided they wanted to create a solution for the ever-changing foodservice industry, and sought to create machinery that would create the best polystyrene foam cup. On April 20, 1960, they shipped their first order of high quality cups and that is when their idea launched the foodservice revolution. Immediately consumers recognized the benefits of Dart’s foam cups including their superior insulation, strength, durability, and ease of transportation—all at a low cost. The demand for these cups increased rapidly as consumers began embracing the on-the-go lifestyle. Dart introduced more foam foodservice products to serve the needs of the new and growing convenience food industry. Five decades later, Dart continues to be a front runner in the foodservice manufacturing industry by providing quality products and exceptional service through the manufacture of cups, plates, containers, lids and straws made from such materials as expanded polystyrene foam, solid polystyrene, polypropylene, polyethylene terephthalate (PET), paper and sugar cane. In addition, the acquisition of Solo® in 2012 expanded Dart's product offering, bringing new paper and plastic lines to the portfolio. 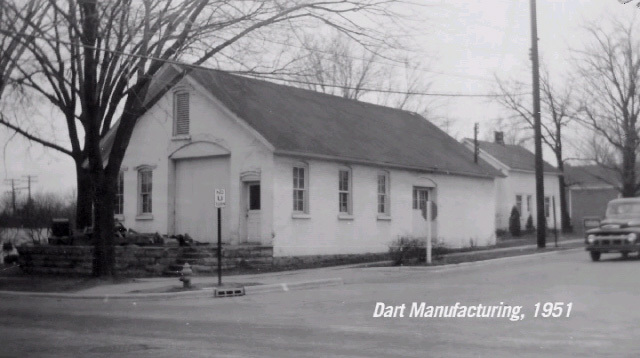 From its humble origins as a machine shop in Mason, Dart has expanded across the globe to include more than 40 locations in seven countries, and about 15,000 employees worldwide. Based on these beliefs, all personnel decisions at Dart are made without regard to any protected characteristics, but rather are based on the demonstrated skills, abilities, and efforts of the individual. Dart will continue to operate as an equal opportunity employer by choice. The importance of our continued efforts regarding equal employment opportunity and our culture of personal respect cannot be overstated in terms of the continued financial growth and organizational development of the company. Throughout the year employees across the globe are committed to giving back to the communities in which they work and live, by raising money to support United Way, Relay for Life, March of Dimes, and local charities. At our company headquarters in Mason, Michigan employees lace up bowling shoes at an annual Bowl-A-Thon to raise more than $10,000 annually in support of local charities including the Capitol Area Literacy Coalition and Child & Family Services. At Dart manufacturing facilities across the U.S., employees have raised thousands of dollars and volunteered time in support of their local communities. Our employees are passionate about creating a sustainable world, and efficiency remains in our core. We continually promote environmental attributes with our products and encourage recycling with our employees and the public. Foam foodservice products can be recycled as part of an integrated waste management strategy and at Dart we encourage the recycling of foam cups and foam foodservice products by offering a variety of foam recycling programs. These programs include, The CARE Program for large operators, Recycla-Pak, a mail-back recycling program for small operators, and also drop-off locations for the general public. Our employees are also doing their part to create a sustainable future through the creation of Dart Environmental Action Teams, located at many Dart facilities. Some of the annual activities that our action teams participate in include the Great L.A. River Clean-Up, where employees clean-up the 51-mile Los Angeles River, and also located at our city headquarters, employees help clean-up the 2.5 mile long Hayhoe River Trail in order to prepare for Michigan’s winter season. Note: Benefits listed below vary based on location and may not apply to international locations. Please contact your local Human Resources for more information. Are you ready to begin your career at Dart? Apply today to join 15,000 exceptional people, all working as one team. Explore all current openings.